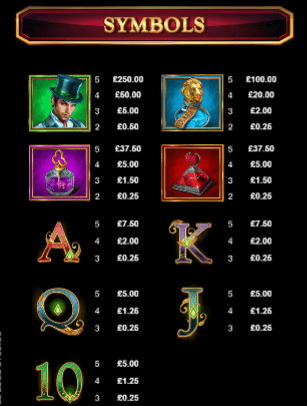 Book of Oz is a 5 reel, 10 payline video slots game created by Microgaming with a Wizard of Oz theme. It's time to put on your ruby slippers and follow the yellow brick road for an adventure of a lifetime exploring the Emerald City. Emerald City is a real treasure trove filled with gorgeous sparkling green emeralds, diamonds, gold coins, magic, and more. You'll find these treasures in the respins feature, free spins feature, and expanding symbols feature. With the enchanting Book of Oz, you can win up to 5, 000x your total stake. Oz is such a wonderful place where so many magical things can happen. 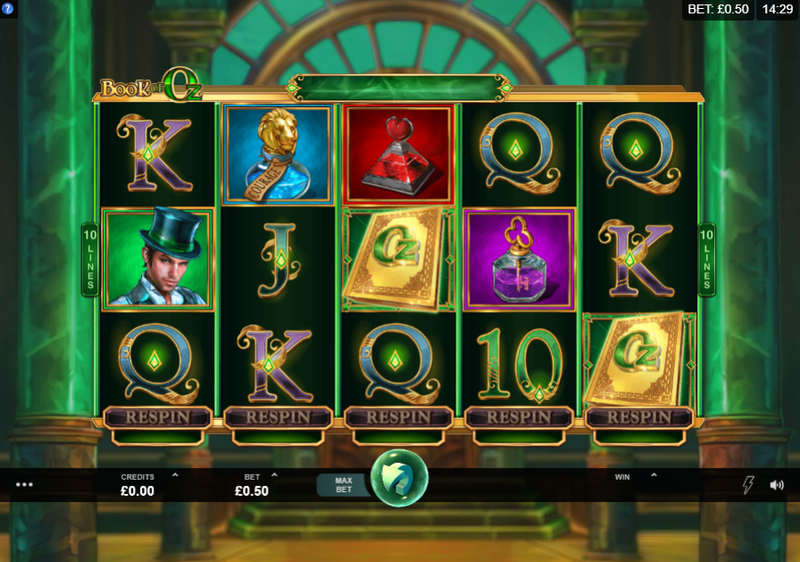 Book of Oz is a 5 reel, 10 payline slot based on the well-loved classic tale 'The Wizard of Oz' by Frank Baum. You'll take a trip to the Emerald City palace with one goal in mind; to find luxurious emeralds that are worth lots of money. The reels are placed inside the beautiful palace which is of course decorated in gorgeous emerald green. The symbols include a variety of mystical objects including wizards, potions, books, hearts, and keys. The Wild and Scatter Symbol - The Book of Oz is both the wild and scatter. The golden book substitutes all other symbols to create winning combinations. Respins Feature - The respins feature allows you to respin the reels as many times as you want (at a small cost, of course) so that you can form winning combinations more easily. Free Spins Feature - Landing 3 scatters will trigger the free spin mode in the slot. You will begin with 10 free spins as well as an extra 10 free spins for every 3 books you land. Land 4 scatters to receive 12 free spins and 5 to receive 25 free spins. Expanding symbols also occur during this feature meaning the whole reel can be filled to create even better prizes. To learn of more bonus features and casino promotions, click here. Book of Oz is a wonderfully enchanting slot. It feels as though you have stepped straight into the magical world that Baum created over 100 years ago. The design is fantastic with whimsical characters, potions, and books, all decorated with emerald green. The free spins feature is a lot of fun as there are plenty of free spins up for grabs. There's even the chance to win up to 5, 000 your stake. If you enjoyed Book of Oz, try more free online slot machine games with free spins.